Dismayed isn’t the right word; neither is disappointed. Disgusted is more like it. With summer heat approaching, Dave and I went to our storeroom over the garage to retrieve our fans. I couldn’t believe it when I saw them… they had not been stored in garbage bags, and upon looking at them, I knew why. I had NOT cleaned them before I put them away last fall. Years ago we did not have air conditioning… on purpose. We built a new house in 1977 and did not install air conditioning; I was afraid our boys would not play outside if we had air conditioning. Finally, in 1994 we installed central air. Then, the next year (1995) we sold that house. The air conditioning in our next house died our first summer, thus we purchased two AC units in two years. We were accustomed to using several fans. We still use fans to help circulate the air in our house. Many people use ceiling fans. We only have one. In several rooms, we still use oscillating fans. Currently, we use six fans. Every fall when we finish using them, I ALWAYS clean them and store them in garbage bags. In 1985, after our house fire in December 1984, we purchased all new fans. They were easy to take apart and clean. As each fan died, we replaced it with whatever kind we could find. Most have been easy to clean. Over the years cheaper construction has become obvious in the noise produced and in the ability to dismantle and clean the fans. My task now was to clean the fans. One purchased last year would not come apart at all, and another could only partially be dismantled. This is when I realized I have never used our air compressor. Our son, Randall happened to be home (he and his family live 2 houses from us); he gave me an air compressor lesson so I could blow the dust from those fans. Then, I realized Dave has been helping me with one of the other fans, using zip-ties to hold part of it together. I’ve never used zip-ties, either. Randall helped me find them and showed me how to use them. And, I thought with all my years of experience, I could clean the fans myself. With Randall’s help, mission accomplished. The 1995 air conditioner was replaced in 2011 and with 6 auxiliary fans, we are good to go for 2013 summer heat. I’ll bet I will clean the fans before storing them this fall, and this time I’ll know how to do every step of the process. Weather anomaly! Record Breaking Snow! 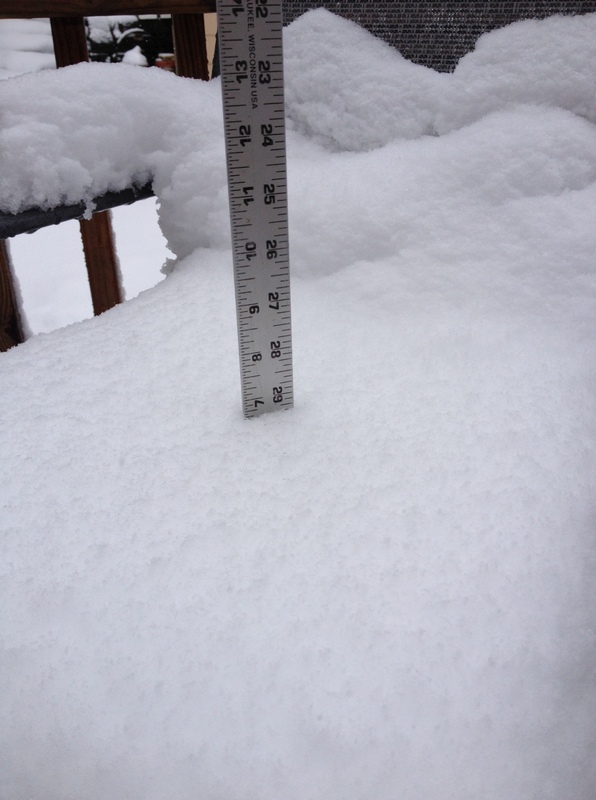 Seven inches of snow by the end of the two-day storm on Friday, May 3, 2013! I thought such a thing was impossible. However, this spring I’ve been researching a family story from 1907. As the story goes, when Clint and Laura Cox with 5 small children (including my grandmother, the oldest at age 10, left on May 1 to spend the summer with relatives in western states, ending in Oregon, they had to take the bobsled to town to catch the train because it had snowed so much. I was skeptical and checked the local newspapers to verify that they had received enough snow to warrant using a bobsled to go four miles to town. It turns out that 1907 is sometimes referred to as “the year without a spring.” March was unusually warm, but was followed by several much colder than normal months with freezing temperatures and several late snowstorms. Much of that weather anomaly is attributed to the Ksudach volcano that erupted on March 28, 1907 in Kamchatka, Russia causing climatic changes in a large section of the mid-section of the North American continent. I keep waiting to hear why we have had such a cool, unending spring in 2013, but no one seems to mention a valid reason. In the meantime, this is a spring to remember, most of Iowa and a large part of the Midwest experienced this unusually late spring snowstorm. By Sunday evening the snow had melted. 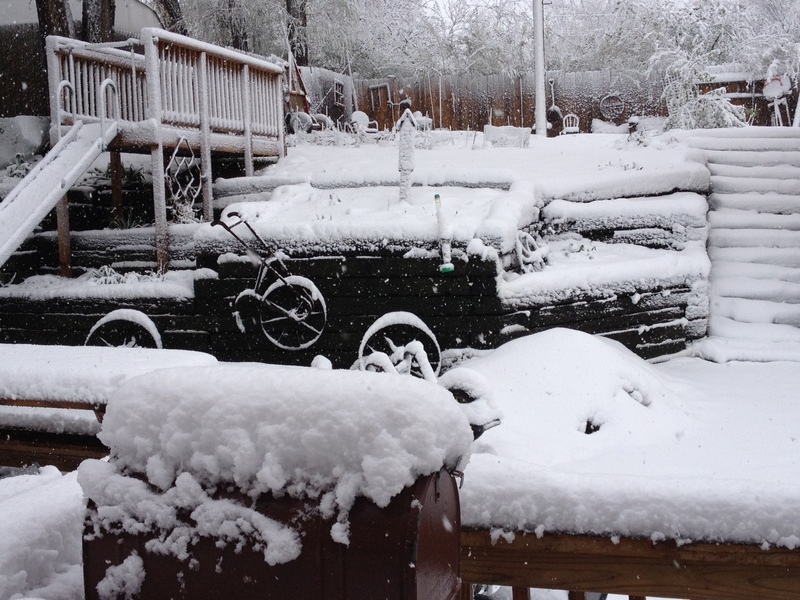 May 3, 2013 Seven inches of snow!